The season was full of surprises — even if you don’t count Tom Osborne’s retirement. At the skill positions were in-state kids from Brainard, Wood River, Papillion, Omaha. Who would have thought this crew would lead the nation in total offense, rushing and scoring? A punishing line led by Outland winner Aaron Taylor certainly helped. A September win at No. 2 Washington made the nation take notice. 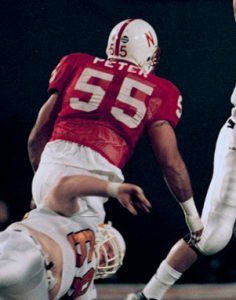 The Huskers steamrolled opponents as Jason Peter (pictured) helped anchor a relentless defensive line. But on a November evening at Missouri, all suddenly seemed lost. Then, just as suddenly, a last-minute drive, deflection and catch kept NU’s title hopes alive. After an Orange Bowl romp over Tennessee came one last surprise — a share of the national title. The 1995 Huskers made it all look so easy. The offense, led by quarterback Tommie Frazier (pictured), ran over, around and through opponents, even without suspended star Lawrence Phillips. The quick, attacking defense featured such stars as Jared Tomich, Terrell Farley and Grant Wistrom, and the unit frequently put points of its own on the scoreboard. After polishing off three Top 10 opponents by an average score of 45-16 during the regular season, the Huskers faced the seemingly unstoppable “Fun ’n’ Gun” Florida Gators. The classic matchup quickly turned into a rout, and by the time the dust had cleared, many were calling the ’95 Huskers the best college team ever. Down to their third-string quarterback midway through the season, the Huskers had to rely on a smothering defense and a bulldozing offensive line to grind out victories that left the pollsters unimpressed. 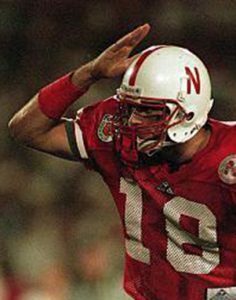 But then, with second-string QB Brook Berringer (pictured) healthy again, the Huskers artfully dismantled No. 2 Colorado, 24-7, and climbed to their rightful No. 1 spot. 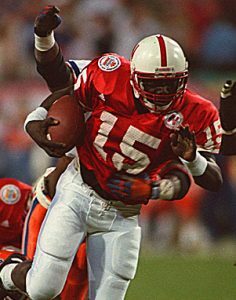 In the Orange Bowl, Berringer and first-stringer Tommie Frazier shared the QB duties, and NU came from 10 points behind to take the swagger out of No. 3 Miami. Even Bubba took notice. A defense led by nose tackle Rich Glover was the nation’s best. The offense, with quarterback Jerry Tagge, wingback Johnny Rodgers and tailback Jeff Kinney, was no slouch, either. The Huskers waltzed through the regular season with one eye on their November date with Oklahoma, whose newfangled wishbone was proving unstoppable. The No. 1 Huskers and No. 2 Sooners played a Game of the Century in Norman that lived up to its billing. Nebraska prevailed, 35-31, thanks in part to Rodgers’ electrifying first-quarter punt return that opened the scoring (video here). Several weeks later, a dismantling of unbeaten No. 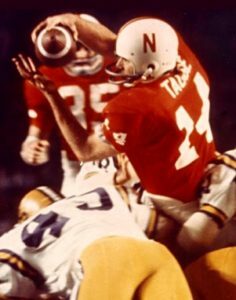 2 Alabama in the Orange Bowl capped the Huskers’ perfect season. The first time is always the sweetest, and this was no exception. Nebraska was tied by Southern Cal on the road early in the season, then went the rest of the way without a blemish. The running of Joe Orduna, the blocking of Bob Newton, and the receiving of Guy Ingles and Johnny Rodgers sparked an offense led by two quarterbacks, Jerry Tagge and Van Brownson. All-America linebacker Jerry Murtaugh anchored the defense. On New Year’s Night, all the right dominoes had fallen and coach Bob Devaney’s No. 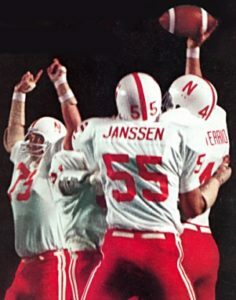 3 Huskers found themselves playing for the national title against LSU in the Orange Bowl. Tagge stretched over the goal line in the fourth quarter for the deciding touchdown.